Revolver's exceptional offense and high-pressure defense earned them a third straight World Ultimate Club Championship. It seemed inevitable that no. 1 seed Revolver would end up in the WUCC men’s final, but no. 4 Colony was also a team of destiny this week. They lost a close one to Toronto GOAT (CAN) in power pools, then took down the no. 3 and no. 2 seeds on their way to face the no. 1. They bested Raleigh Ring of Fire (USA) 15-14 on double game point and held on in the lightning-delayed semifinal versus Austin Doublewide 10-9 (USA). All that remained was Revolver. This is a familiar narrative. The short-handed underdogs (Colony was down to 19 roster players by game time due to injuries) versus the formidable favorites and defending champions. The underdogs fought with heart and skill, but Revolver refused to give them the openings they needed. They proved why they are considered the best men’s team in the world. In contrast to the “lightning rounds” on the prior evening for the conclusion of the semifinal round, the crowd was a bit subdued at the 8:30 AM start time. However, the teams had no such issues, and it was an intense match from the start. The beginning of the game was a little rough for the American stars on the Colony O-line, as Jimmy Mickle overshot on a huck and Chris Kocher put it out of reach in the end zone, but the Revolver D-line gave it back twice and Mickle hit Tom “Cupcake” Tullet cutting deep off the backside. From even that early series of possessions, it was clear that Colony’s offense was very reliant on their trio of stars. Mickle, Kocher, and Tullet dominated the team’s touches and made most of the difficult throws. When’s Revolver defense reached it’s most unrelenting, those three were counted on to find a way to get the Aussies moving forward. While their defense showed tenacity independent of the talent of their three stars, the offense was built around them. “I think they played great offense, they leaned on [Mickle], [Kocher], and [Tulett] pretty heavily. And they’ve got a good group of receivers,” said Revolver coach Mike Payne after the game. He compared their offensive style to that of Death or Glory, one of the greatest teams in ultimate history and three-time World Champions. Colony would attack with dumps and swings, using wide arounds early and smoking inside breaks late to go from sideline to sideline and find cutters with yardage. From Revolver’s first offensive point, Colony’s John McNaughton made it tough for Grant Lindsley to find space in a battle that was a joy to watch all game. Jordan Marcy put it too far ahead of Ashlin Joye, and Colony had their first break chance. However, Colony gave it right back and, given a second chance, Revolver worked it in cleanly for 1-1. Colony’s offense, despite its clear plan, strong talent, and consistent effectiveness, was not perfect. On the next point, a critical play occurred that overshadowed the rest of the game. Sawyer Thompson got a huge layout block on a Pete Eley cut toward the sideline, and Revolver patiently worked it up for the only break of the first half to grab the 2-1 advantage. Both offenses settled in for a series of holds, with Colony showing a bit of junk to start on defense and Revolver in tight match-up defense. At 4-3, a collision with Byron Liu sent Mickle off holding his face, but Tullet helixed a high scoober to Eley by the right cone. Neither team could garner separation. A near callahan for a Colony hold was matched by great defense from Revolver’s John Stubbs, only to be countered by a layout block by Paul Denyer. A tidy Revolver hold to Antoine Davis was answered by a wicked Tullet inside backhand break that set up a give and go goal for him. Upping the pressure at 6-6, Colony finally caught their first whiff of a turn from the Revolver O-line since the first possession. Simon Higgins popped an upline over Lindsley, but he managed a diving layout grab just past a bidding McNaughton. After Tullet toed the back line to pull down Mickle’s huck to bring it to even at 7-7, Colony was back with more defensive pressure. In a moment that Mark Evans later pointed to as a turning point of the game, an upline bounced off Lindsley’s fingertips and the crowd gasped. But it popped right up for him to grab, and he immediately put up a floater that Davis pulled down in traffic for half, 8-7. With that opportunity gone, Colony’s hill to climb went from one break to two against a deep Revolver team that had spent most of their week pulling away in the second half. Colony tried a three-person cup to begin the second stanza, but a pair of hammers over the top in the windless complex, and it was off to the races for a 9-7 lead. It was readily apparent that Colony was running out of both energy and time. Mickle and Kocher, and to a lesser extent, Tullet, all looked like they were approaching empty. Evans, in many ways the fourth member of a terrifying offensive foursome for the rest of the tournament, was struggling to pick up much yardage. Revolver’s defense, continuing to rotate through two separate lines, was only ratcheting up their intensity. But the Australian defense was still playing with fire and hunger, just hoping to do enough against Revolver to be there to capitalize on a mistake. Down 10-9, Colony got just their second turn off the Revolver O-line when Davis put up a speculative huck that Rob Andrews skied for over Sanchez. However, the chance evaporated under the heat of strong team defense by the Revolver O-line that led to an Eli Friedman handblock. An amped-up Colony gained another break opportunity when Sanchez overthrew Lindsley. The Australians worked it smoothly and put up a OI backhand to a wide open Gavin Moore for their first break to tie tie the game, 11-11. With some momentum to the Aussies, the crowd got loud. Cupcake crossed over again to the D-line, but Revolver held cleanly. The same can’t be said for Colony, who started to show the impact of Revolver’s depth and pressure. Kocher put up a floater for Mickle, but it was out the back. Eli Kerns overthrew Liu deep, but John Stubbs handblocked Kocher to get it back. Colony forced a floating high stall scoober from Kerns, but Stubbs skied Kocher to save it. After a timeout, Julian Childs-Walker found the inside to Cohen to put Revolver back up a pair, and at 14-12 it felt over. A pair of holds later, it was over. Revolver needed to avoid costly mistakes against such a fast and hungry opponent, and did so. They used their biggest advantages—their depth and their experience—to overwhelm the Australians with a consistent and unrelenting pressure. They were able to make more adjustments than Colony, who was uncoached. And they were able to wear down Mickle, Kocher, and Tullet; Kocher struggled in the game’s final points and Mickle played almost no defensive points until late in the game. “We have a bunch of good defenders. I was working so hard on offense, I wasn’t ready to go out there and give everything I had as much as someone else is,” said Mickle. For Colony, it was the end of an impressive run, but questions remain about what amount of credit should be ascribed to their American additions. While it’s clear efforts were made on both sides to make a full commitment to Colony ultimate, there are still critics, and Colony knows it. For Revolver, a third World Championship is an outstanding, if at this point unsurprising, achievement. Payne compared the team’s title to “candy” for the half of the team that wasn’t with them for previous Club Worlds victories. But when you’re the best, it’s hard to find something that’s enough to satisfy. Colony will go back to Australia with renewed focus and understanding of what it takes to be the best. Revolver will return to California with the same greatness they’ve sheathed themselves in for years. Both will probably be better for it. 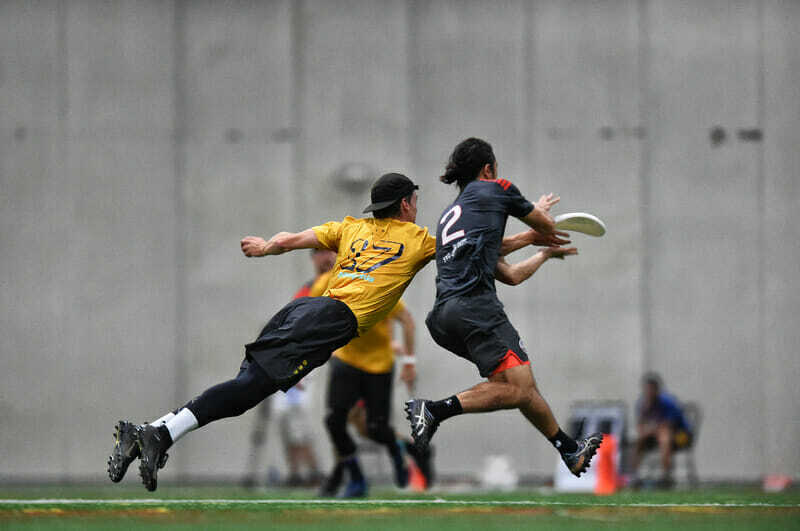 Comments on "Revolver’s Depth Shines in WUCC Championship Over Feisty Colony (Men’s)"